I fail the exam with 57 % today feeling miserable. I used Certified Associate Java SE 8 Programmer by Jeanne Boyarsky and Scott Selikoff and OCA/OCP Java SE 7Programmer I & II by Kathy Sierra and Bert Bates. I have also use eclipse and netbean to test several scenarios. But still couldn't pass the exam. I am thinking of studying the java specification 8 fully.Maybe with this instead of those study guide I will pass. Looking for any suggestion how can I pass this exam? raghav singh wrote: I fail the exam with 57 % today feeling miserable. Sorry to hear you have failed. But don't be disappointed and definitely don't feel miserable! 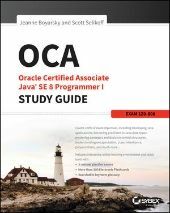 The OCA certification exam is a hard and tough exam, it requires a good and solid understanding of Java and OO basics. You can perfectly be able to write working Java programs and still fail this exam. And you are definitely not the only one who has failed this certification exam. You'll find here and here other experiences of ranchers who failed (or struggled with) the OCA exam. This threads also contain some excellent advice to prepare yourself for the exam and almost be guaranteed to pass. So definitely worth reading! raghav singh wrote: I used Certified Associate Java SE 8 Programmer by Jeanne Boyarsky and Scott Selikoff and OCA/OCP Java SE 7Programmer I & II by Kathy Sierra and Bert Bates. These are excellent resources to pass the OCA certification exam. raghav singh wrote: I have also use eclipse and netbean to test several scenarios. But still couldn't pass the exam. For me using an IDE during the preparation for the certification exam is definitely a don't. Why? Very easy: on the actual exam you also don't have an IDE (and compiler) to help you verify and run code. You are all on your own. So my first advice would definitely be: get rid of your IDE, only use your favourite text editor, javac and java. Other opinions about using an IDE while preparing for the OCA exam can be found here. raghav singh wrote: I am thinking of studying the java specification 8 fully.Maybe with this instead of those study guide I will pass. raghav singh wrote: Looking for any suggestion how can I pass this exam? 1/ Get rid of your IDE. It's useful when writing production code, but useless when preparing for the OCA exam. 2/ Did you take the Enthuware exams? If yes, which scores did you have on the mock exams? 3/ What's your background (e.g. Java greenhorn, working as a Java developer for 1 year, Java student,...)? 4/ Do you have any idea about why you have failed? Did you run out of time? Did you score poorly on specific topics (e.g. overloading, overriding, String, control flow,...)? Based on your answers on these questions, I can provide you some advice (besides all the excellent advice you can find in the aforementioned topics). Enthuware worked for me. Some concepts I thought I had down, I actually didn't fully understand. I'm not sure if they have it for Java 8, but I would definitely take look into it. I passed my first time. Spend time on Enthuware though, don't expect it to be a shortcut. Yes, they have! Check the updated overview of study materials for OCA 7/8 for more information (or simply click on this link ). Ok Many thanks for replying with such detail analysis. Yeah sure i will stop using IDE.Concerning my background i am java developer for 1 and 1/2 year. I have developed my own payroll program with mysql and also have applied some basic stuff of hibernate to the project. Yeah concerning topics. I have problem running loop program in my head. I loss count of the increment each time and in the exam the eraseboard was full. Didn't have anyplace to use trace table.Also i have problem with exception handling,lambda, and date topics and sometime i can't decide whether a program will compile or not leaving me in a state of confusion. I think i don't know how do i run the class in my head.There is so much to analyze.Where do i start?What to look for?How do i identify traps set by the examiner? Well apart from those topics i am weak in using this and super of contructors. Concerning enthuware... i am buying the licence tomorrow.I think it has 600 questions in it.So it will be good practice for me. raghav singh wrote: Yeah sure i will stop using IDE.Concerning my background i am java developer for 1 and 1/2 year. I have developed my own payroll program with mysql and also have applied some basic stuff of hibernate to the project. That's already a very good starting point. But as I said before: knowing how to write a Java program is not enough to pass the exam. The certification exams require a good and solid understanding of all exam objectives. raghav singh wrote: I have problem running loop program in my head. I loss count of the increment each time and in the exam the eraseboard was full. Didn't have anyplace to use trace table. Never try to process complex loops in your head! That's almost impossible to do. I have +10 years of experience in Java development and I use pen and paper (or an erase board) as well. Next time, explicitly ask for an eraser or for additional eraseboards. The test taking center is obliged to provide you with as much as writing material you want. But you have to be a little bit flexible as well. If they provide you with an eraser and 2-3 eraser boards, you should be fine. If they don't provide an eraser, just ask for a few additional eraser boards. raghav singh wrote: and sometime i can't decide whether a program will compile or not leaving me in a state of confusion. That's because you have used an IDE during your preparation. So you never had to spot compiler errors yourself. You wrote a compiler error and the compiler already marked the error with a nicely looking red line Getting rid of the IDE and using a text editor with javac will drastically improve this ability. raghav singh wrote: I think i don't know how do i run the class in my head.There is so much to analyze.Where do i start?What to look for?How do i identify traps set by the examiner? That's all about test taking techniques. One small but very useful tip: when you get a question with a code snippet, just have a quick glance to the answers. Do you see an answer option like "Compilation fails"? You know you need to analyze the code snippet for compiler errors. Do you see something like "Compilation fails due to an error on line X"? You know you only have to focus on the lines mentioned in the different answer options. Do you see no "Compilation fails" answer options? You don't have to worry about compiler errors (so you also don't need to analyze the code snippet and you can save precious time). Also when taking several Enthuware mock exams your test taking techniques will improve. But taking Enthuware mock exams is only be useful and helpful if you have a good and solid understanding of the exam objectives. Don't expect your score of 57% to improve to 77% just by taking these Enthuware mock exams. That will definitely not happen! raghav singh wrote: Concerning enthuware... i am buying the licence tomorrow.I think it has 600 questions in it.So it will be good practice for me. Use Enthuware mock exams carefully! These exams are the only objective indication to measure your current level and Java knowledge. So in your situation, I would just take the Assessment (Starter) Test and/or the first mock exam. And based on your scores (which will probably be similar to the actual exam score), you'll know what to do. Do not rush through your mock exams if your score is (too) low. If you are missing the understanding of some concepts, taking more exams will not increase your score drastically. If you have +80% (or even +70%) you can improve your score by taking more mock exams, because then it's more about test taking techniques (spotting compiler errors more easily, how to evaluate a code snippet more quickly, and so on). If your score is too low, you need additional studying. So it's back to your study guides and again read/study them carefully, write boatloads of code snippets (without an IDE), make flash cards to study on the train, when you are waiting for the bus,... When you have finished studying, it's time to take another mock exam. And the score will tell you again what to do. Sure it helps quite a lot.Time to get in study mode. Happy studying! And keep us posted about your progress, so we can provide additional advice if needed.